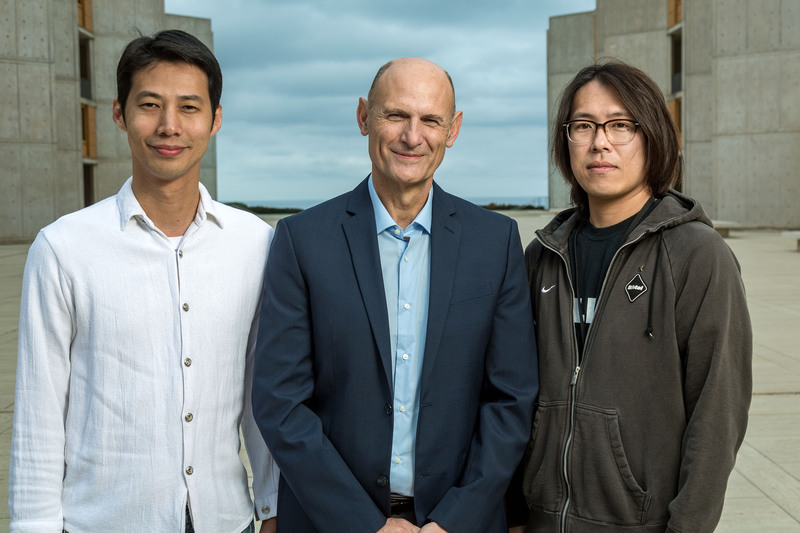 LA JOLLA—Salk scientists have created a new version of the CRISPR/Cas9 genome editing technology that allows them to activate genes without creating breaks in the DNA, potentially circumventing a major hurdle to using gene editing technologies to treat human diseases. Most CRISPR/Cas9 systems work by creating “double-strand breaks” (DSBs) in regions of the genome targeted for editing or for deletion, but many researchers are opposed to creating such breaks in the DNA of living humans. 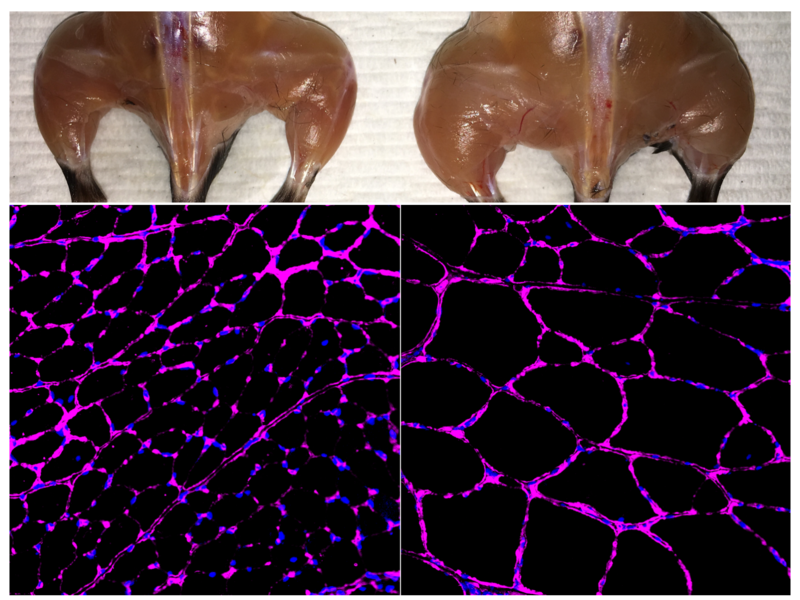 As a proof of concept, the Salk group used their new approach to treat several diseases, including diabetes, acute kidney disease, and muscular dystrophy, in mouse models. 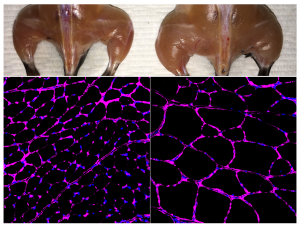 The Belmonte lab’s advanced in vivo Cas9-based epigenetic gene activation system enhances skeletal muscle mass (top) and fiber size growth (bottom) in a treated mouse (right) compared with an independent control (left). The fluorescent microscopy images at bottom show purple staining of the laminin glycoprotein in tibialis anterior muscle fibers. In the original CRISPR/Cas9 system, the enzyme Cas9 is coupled with guide RNAs that target it to the right spot in the genome to create DSBs. Recently, some researchers have started using a “dead” form of Cas9 (dCas9), which can still target specific places in the genome, but no longer cuts DNA. Instead, dCas9 has been coupled with transcriptional activation domains—molecular switches—that turn on targeted genes. But the resulting protein—dCas9 attached to the activator switches—is too large and bulky to fit into the vehicle typically used to deliver these kinds of therapies to cells in living organisms, namely adeno-associated viruses (AAVs). The lack of an efficient delivery system makes it very difficult to use this tool in clinical applications. Izpisua Belmonte’s team combined Cas9/dCas9 with a range of different activator switches to uncover a combination that worked even when the proteins were not fused to one another. In other words, Cas9 or dCas9 was packaged into one AAV, and the switches and guide RNAs were packaged into another. They also optimized the guide RNAs to make sure all the pieces ended up at the desired place in the genome, and that the targeted gene was strongly activated. “The components all work together in the organism to influence endogenous genes,” says Hsin-Kai (Ken) Liao, a staff researcher in the Izpisua Belmonte lab and co–first author of the new paper. In this way, the technology operates epigenetically, meaning it influences gene activity without changing the DNA sequence. Izpisua Belmonte’s team is now working to improve the specificity of their system and to apply it to more cell types and organs to treat a wider range of human diseases, as well as to rejuvenate specific organs and to reverse the aging process and age-related conditions such as hearing loss and macular degeneration. More safety tests will be needed before human trials, they say. Other researchers on the study were Toshikazu Araoka, Pradeep Reddy, Min-Zu Wu, Takayoshi Yamauchi, Masahiro Sakurai, David O’Keefe, and Concepcion Rodriguez Esteban of the Salk Institute; Yinghui Sui, Cheng-Jang Wu, and Li-Fan Lu of the University of California, San Diego; Estrella Nuñez of Universidad Católica; Pedro Guillén of Fundación Pedro Guillén; and Josep Campistol of Hospital Clinic of Barcelona. The work and the researchers involved were supported by grants from the Uehara Memorial Foundation, the Moxie Foundation, The Leona M. and Harry B. Helmsley Charitable Trust, the G. Harold and Leila Y. Mathers Charitable Foundation, Fundación Dr. Pedro Guillén, Asociación de Futbolistas Españoles (AFE), Universidad Católica de San Antonio de Murcia (UCAM), the National Institutes of Health, Howard Hughes Medical Institute, and a Calouste Gulbenkkian Foundation Fellowship.